If you have been watching the Senate hearings on extrajudicial killings, you’ve probably noticed the presence of Jose Luis Martin “Chito” Gascon, chairman of the Commission on Human Rights (CHR). With that said, there was something he said in the hearings that raised my eyebrows. 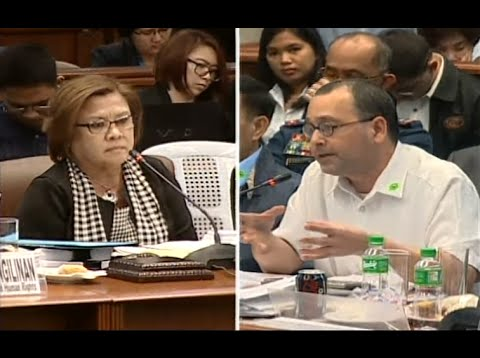 When asked about how many cases of policemen killed on duty the CHR is investigating, Gascon’s answer was one (1) case. To be fair, Gascon argued that the CHR usually handles cases against the government. Per EO 163 s. 1987, CHR is tasked to investigate violations involving civil and political rights (CPR), or rights that generally restrict the powers of the government in respect of actions affecting the individual freedoms and opportunities for participatory governance [LincolnU]. But policemen have CPRs too. If Gascon is so convinced that the President sanctions summary killings, wouldn’t it mean that Duterte is trampling on the right to life of policemen that he would have been using as pawns? With just 1 case out of 150 involving a dead cop, Gascon clearly doesn’t see it that way. I am usually snarky to people that I do not like, but I give lots of consideration for groups whom I believe are reasonably predisposed to act a certain way. Gascon, being the CHR chair, is expected to be far more passionate in advocating for human rights than a pedestrian like me. Hence, his eagerness over this particular senate investigation is something that I did not take against him. Chito Gascon is the CHR chair for crying out loud! To fight for human rights is supposed to be second nature to him. But before we go further, let me give you a quick rundown of what we learned from the two witnesses. Sen. De Lima interrogated two women whose family members are alleged victims of extrajudicial killings. The first witness, who identified herself as the 26-year-old “Harra Kazuo”, was the wife of suspected drug dealer JP Bertes and daughter-in-law of Renato Bertes. Pasay City cops killed the two Berteses on 07 July 2016. Harra admitted the following JP sold shabu in 2015 and bribed cops once with P10,000 in exchange for their silence. JP was already trying to quit drug dealing when Pasay cops raided their home and arrested JP and Renato some time before 07 July 2016. Harra learned of their death on 07 July 2016, with Pasay P/Supt. Nolasco Bathan claiming that the two tried to grab the cops’ firearms as they were about to be detained [Star]. The second witness, 23-year-old Mary Rose Aquino, is the eldest daughter of suspected drug dealer couple Rodelio and Rosalie Campos. Aquino admitted that her parents used and sold drugs sourced from Antipolo cops who, in turn, sourced them from police operations. One day, her parents left home to remit P50,000 pesos to the corrupt Antipolo City policemen. They never came back. They were murdered [Star]. Everyone, regardless of political affiliation, will agree that this Senate Hearing on Extrajudicial Killings is aimed pinning the hundreds of murders in the past couple of months on President Duterte. Despite my personal political inclinations, I still am a curious political observer, so I find this senate investigation extremely interesting. The murders discussed in the hearing are abhorrent and detestable, but it’s time to put things back to perspective. Now, let’s apply this concept to the two testimonies. Both witnesses alleged that corrupt cops are “cleaning up evidence” as they eliminate their minions to prevent the latter from exposing their modus operandi. That is, corrupt cops are executing their drug assets to avoid incrimination [Star]. Did Duterte formally order those killings, or did Duterte tolerate the cops’ abuses? First, did Duterte formally order those killings? In short, Duterte never ordered summary killings, and neither of the witnesses’ statements suggested the same. Second, did Duterte tolerate the cops’ abuses? The Pasay City cops have already been charged with murder [Star], while the Antipolo cops have been relieved [GMA]. Way before the hearing, Duterte has even named and shamed police generals for their alleged links with the drug trade [TP: PNP Generals]. Hence, it is clear that in as far as the two testimonies are concerned, the president didn’t tolerate EJKs. In as far as the Senate Investigation is concerned, de Lima failed to show that the allegedly drug-related deaths are part of government policy. The second day actually turned out to be free positive PR for PNP Chief Ronald “Bato” dela Rosa, as he charmed everyone with his honesty and dedication to his work. Bato even managed to secure the senators’ unsolicited promises to increase funding for salaries, firearms, patrol cars, fuel, training facilities, lawyers’ fees [MB]. Yes, that’s how persuasive Bato was on that day, and he was defending the police force as a whole the entire time. Unfortunately, despite the “prosecution’s” failure to link the murders to state-sanctioned extrajudicial killings, it appears that Chito Gascon remained unfazed. At the end of the second day, Gascon said the International Criminal Court (ICC) may possibly assume jurisdiction over the extrajudicial and vigilante killings of suspected drug dealers if the Philippine government fails to address the issue [Star]. So ThinkingPinoy tried to look for ICC guidelines related to Gascon’s claim. According to an ICC document, the ICC “can only exercise jurisdiction where national legal systems fail to do so, including where they purport to act but in reality are unwilling or unable to genuinely carry out proceedings [ICC]”. Wouldn’t it be premature for Gascon to say the the government “failed” to address the EJK issue when the fact of the matter is that the new administration is barely two months old? Has Duterte government prevented the judiciary from exercising its powers? Has the Duterte government ignored even a single case of police abuse? Quite the contrary actually, so why does Gascon insist on the ICC angle despite the absence of prerequisites? Simply put, why the fear-mongering? To answer that, I researched Gascon’s past to have an idea of the man that he is right now.